Not all prophecy in Scripture has been fulfilled yet but the second coming of Jesus Christ was totally fulfilled in the first century. The second coming of Christ had to do with the destruction of the Jewish Age and the establishment of Christ's Kingdom. Jesus said that some of His disciples will not finish preaching through all the cities of Israel before He comes back (Matthew 10:23). Jesus said that some who were living during His time would not die before they see the Son of Man (Jesus Christ) coming in His Kingdom (Matthew 16:28). Jesus said that "this generation" will not pass away before all these things concerning His second coming are fulfilled (Matthew 24:34). He was talking to the people of that time and the generation of that time. He was saying that they (not us) would be witnesses to these things happening. Some have argued that Jesus was talking about His glory that His disciples would behold when they reach the top of, what now is known as, the Mount of Transfiguration. But that had nothing to do with Jesus coming back to establish His Kingdom. Besides, as one commentator put it, it's obvious that the people who were with Jesus would be alive for the little time it took for Him to go up the Mount and come back. It wouldn't be a big deal for Jesus to say that some of those who were with Him would still be alive by the time He returns from His trip up the Mount. Jesus wasn't referring to His trip up the Mount and back when He said that some would not see death before He returns. He was referring to His second coming. That's when He would establish His Kingdom. All this means that the second coming occurred in that generation, not in a generation some thousands of years later. Jesus said that when Jerusalem is surrounded by armies and is destroyed that would be the time of His second coming. This already happened between 63 A.D. and 70 A.D. Jesus said that the Gospel will be preached to every nation before He comes. The Apostle Paul says in Colossians 1:23 that the Gospel had already been preached to all nations (that is all nations of the then known world of the Roman Empire and beyond). One of the reasons that this Gospel was to be preached to all nations was in order to be a witness to them that God was through with Israel as a nation for its ultimate disobedience. The end of the world that Jesus was talking referred to the end of the age, not the end of the physical world. The word "world" in the passage comes from the Greek word "aion" meaning "age". The other Greek word for "world" is "cosmos" which refers to the physical world, but that's not the Greek word that's used in Scripture in reference to when Jesus returns. Jesus was referring to the end of the Jewish Age. That is why Jesus Himself said the "axe is laid at the root" (Luke 3:9) meaning the destruction of the nation was near. God is still committed to His elect individual Jews who turn to Christ for salvation. But, He is through with Israel as a nation. The last time God prophesied that the Jews would return to the land was fulfilled after their return from the Babylonian captivity. During the Babylonian captivity the Jews were spread throughout all the nations of the Babylonian empire. It is vital to understand that God's promises concerning the land to the Jews in the Old Testament were conditional - only so long as they continued to obey Him were those promises concerning the land binding (read Deuteronomy 28). We read in the Book of Joshua 21:43, 45: "And the Lord gave unto Israel all the land which He swore to give unto their fathers; and they possessed it, and dwelt therein. There failed not ought of any good thing which the Lord had spoken unto the house of Israel; all came to pass." Thus, there is no promise concerning the land that still awaits any fulfillment. Furthermore, almost none of the Jews in modern Israel are descendants of the original Jews of Palestine thousands of years ago. Most of the Jews in Israel today are descendants of Europeans who had converted to Judaism in the Middle Ages (known as Khazar or Ashkenazi Jews). The modern state of Israel today has the right to exist like any other nation, but it does not have the right to territorial conquest and control in the name of Zionism. Jesus said that every eye will see Him at His return (that is everyone in Jerusalem at the time of its destruction) will know that Jesus was ultimately behind Jerusalem's judgment and destruction for its ultimare rejection of Him as Messiah. The word "see" in the passage comes from the Greek word "eido" which can also mean "see" in the sense of understanding or comprehending like when you say to someone "Do you 'see' what I mean?" In the Old Testament when Babylon was destroyed the Scripture says that the stars of heaven fell and the Sun and moon turned their color. This is known as apocalyptic language in Scripture. Whenever a very major event affecting Israel happens such language is used. The Book of Revelation uses similar language also. Revelation is to be interpreted symbolically, for the most part. The Roman armies surrounded Jerusalem from 63 AD to 70 AD (seven years) and totally destroyed Jerusalem and the Jewish temple, as Jesus predicted. In the middle of those seven years ancient historians like Josephus record that Jews who believed in Christ had an opportunity to escape Jerusalem so that they would not be killed. These Jews escaped to Pella in Jordan. But, didn't Jesus say about the temple that not one stone would be sitting on another when it's destroyed? How is it then that in the temple remains now there are still stones laying intact on each? What Jesus said about the temple, that one stone will not rest upon another, must be understood as hyperbolic language (exaggeration, which is a useful tool and form of verbal expression in society). There are other examples in Scripture of hyperbolic language. The context of Scripture (of what all of Scripture teaches on any issue is always the key to proper and accurate interpretation). The ancient Jewish historian Josephus was allowed by the Romans to describe and write about what was happening in Jerusalem at the time of its siege and destruction by the Roman army. Among the things Josephus describes are the miraculous signs that occurred in Jerusalem prior to its destruction. All of this was prophesied by Jesus. The famines and earthquakes that Jesus said would precede His return also occurred during the first century and some of these are recorded in the New Testament (i.e. the Book of Acts). Jesus was simply saying that things would continue, just as they did before, that there would still be earthquakes, famines, even marriages, before He comes to establish His Kingdom. He didn't mean that these things would increase in frequency. He wasn't saying, for example, that marriages would increase in frequency before He returned! What about the supposed covenant of peace with Israel made by the Anti-Christ that the Book of Daniel talks about? There's no covenant of peace with Israel. As the great and eminent Bible commentator of old John Gill says about Daniel 9:27: "... but this is to be interpreted of the Roman people, spoken of in the latter part of the preceding verse; who, in order to accomplish their design to destroy the city and temple of Jerusalem, made peace with many nations, entered into covenant and alliance with them, particularly the Medes, Parthians, and Armenians, for the space of one week, or seven years; as it appears they did at the beginning of this week". Daniel 9:27 says the covenant is with "many". It has nothing to do with a covenant with Israel. Before 70 A.D. Jews who became Christians still had to follow the religious rituals and traditions of the Jewish ceremonial laws (i.e. Scripture teachesthat Timothy, whose mother was Jewish and whose father was Gentile, was circumcised, and that by the leading of the Apostle Paul himself. Because Timothy's mother was Jewish, according to Jewish law that made Timothy Jewish). So, even though Timothy had become Christian, the Apostle Paul still made sure to get him circumcised. Christ's Kingdom had not been established yet. But, Gentiles, who during this time became Christian, were not under obligation to follow the religious customs, rituals, and traditions of the Jewish ceremonial laws (Acts 15:20). In the Book of Hebrews the writer says that "we are receiving a Kingdom". The Kingdom had not yet been officially established before the destruction and judgment on Jerusalem which Jesus prophesied and which occurred in 70 AD. After 70 A.D. and the establishment of the Kingdom none of the ceremonial laws applied even to the Jews who had converted. All the Jewish ceremonial laws came to a permanent end. Now, the Kingdom is growing and will one day fill the earth. The Scripture teaches that at some point in the future the final judgment will occur. All the wicked will be once and for all destroyed and the Son will give the Kingdom over to the Father and God will be all in all. Before 70A.D. believers who died remained in a state of death ("sleep"). After 70 A.D. all believers who had died (over the centuries) had their souls resurrected and united with their new and eternal bodies prepared for them in heaven, as Scripture teaches. Christians who are alive now, when they die, will not remain in a state of death (or "sleep") but, instead, their souls will instantly be changed (become immortal) and their souls also will also be united with their new and eternal bodies which, Scripture says, is reserved for them in heaven (2 Corinthians 5:1). This is the on-going process of the Rapture. The Apostle Paul says in in 2 Corinthians 5:1 that Christians have an eternal body (not a temporal body, but an eternal body) reserved for them in heaven (obviously the heavenly body is being kept for the time when their souls are resurrected). In the context of Scripture Satan is now bound for a "thousand" years only to the degree that he cannot deceive all the gentile nations as he once did. Outside that limitation, Satan is as free to do his mischief as before. The Millennium is symbolic and stands for the growth of Christ's Kingdom now. The number "thousand" is used symbolically just as when God says in Scripture that the cattle on a thousand hills are His. Of course, He owns more than the cattle on a thousand hills. It means all belongs to God. In the Book of Daniel it says that Christ's Kingdom will be like a rock cut out of a mountain not by human hands (Daniel 2:34), and that this rock will grow into a mountain that fills the whole earth (Daniel 2:35). Christ's Kingdom doesn't fill the earth suddenly but gradually. Christ said that His Kingdom would be like the leaven in bread which spreads gradually throughout the whole bread (Matthew 13:33). Christ's Kingdom has always been spiritual, not political. It wasn't political then, it's not political now, and it's not political in the future. Christ rules spiritually in the hearts of men. This rule will affect politics, but the rule itself is not political. Almost all evangelical Christians today have absolutely no deep understanding of Christian doctrine, theology, Scripture, including prophecy! They only want thrills and the frills. They're looking for a literal, glitzy, Kingdom like the disciples in Jesus' day thought He would establish. And just as the Jews of Jesus' day wrongly understood His first coming, Christians of today wrongly understand what Scripture means by His second coming. The Old Jerusalem of Judaism has been destroyed in 70 A.D.and the New Jerusalem (Christ's Church) now stands forever in its place. The modern state of Israel today has every right to exist but only like any other nation. Modern Israel has nothing to do with Bible prophecy or Scripture. Revelation says that the New Jerusalem is the bride of Christ (Revelation 21:2). We know from other Scriptures that the Bride of Christ is the Church, Christ's Kingdom permanently replacing the old Jerusalem of Judaism under the law. In Revelation 22:15you will read that outside of the New Jerusalem are evil doers - that's the world. We are in the world but not of it. The New Jerusalem is not a physical city where outside of its doors are evil doers. That's not how to interpret the passage. In fact, unlike the time of the Babylonian captivity hundreds of years prior, the 70 A.D. destruction of Jerusalem and the Temple was so complete and thorough that even the genealogical record of the priests and their lineage was totally destroyed. God has totally put away Judaism and Israel as a nation once and for all. Today's Judaism and modern state of Israel are not recognized by heaven's God. The true temple of God now is the body of believers in Jesus Christ, as Scripture says in various New Testament passages. What about the argument of double fufillment of these prophecies? The doctrine of double fulfillment would not apply to what Christ says about His return and endtimes because the time frame given by Christ and by Scripture preculudes the possibility of a double fulfillment in these matters. Jesus said it would be in His generation and be witnessed by those to whom He was speaking. Also, a double fufillment would mean that believing Jews would inherit separate promises from believing Gentiles and the Scripture teaches in Galatians and elsewhere that Abraham's spiritual seed is one and indivisible and that both Jewish and Gentile believers inherit all of the same promises together. What about Zechariah 14 where we read that Christ would split the earth in two upon His return? Matthew Henry in his famous commentary says that Zechariah 14 is to be interpreted symbolically and spiritually. Read what he says in his commentary. The context of all of Scripture has to be considered before we say something is symbolic or literal. 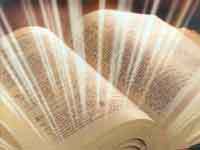 There are many Old Testament prophecies that have been fulfilled spiritually in the New Testament and the New Testament writers allude to this. "The prophet Amos (in the Old Testament) had prophesied the future building of the Tabernacle of David to receive the saved of the heathen (Amos 9:12). In a special counsel of the apostles and other leaders, James (in the New Testament) declared that this prophecy was fulfilled as people were being converted through the preaching of the gospel and were becoming the spiritual house of God (Acts 15:13-19). This was called 'the true Tabernacle, which the Lord pitched, not man (Hebrews 8:2)' " (Evangelist John L. Bray in Biblical Perspectives, December 1, 2009). Since Christ Himself says in Revelation 1:1 to interpret Revelation symbolically then that's how we must interpret the Zechariah passage also. In the very first verse of the very first chapter we read, "The revelation of Jesus Christ, which God (the Father) gave unto Him, to show unto His servants things which must shortly come to pass; and He sent and signified it by His angel unto His servant John" (Revelation 1:1, KJV). The word "signified" in the passage comes from the original Greek New Testament word meaning "signs" or "symbols". Thus, Revelation was meant by Christ to be interpreted symbolically, not literally. The "last days" are over. The Apostles said that they were living in the last days. That was two thousand years ago! What they meant is that they were living in the last days of Judaism that was still recognized by God. This view that Christ's second coming occurred in 70 AD during the destruction of Jerusalem is known as Preterist (or fulfilled) eschatology. There is much, much more to be said on this subject. Please check out the various articles, views, and interpretations concerning preterism here. Also, the reader is encouraged to read "The Bible Vs. The Traditional View of Hell" here. Some truths I share in that article will help the reader to understand better what has been said in this article. The writer is greatly indebted to the writings of the Rev. John L. Bray (Christian evangelist) for coming to know and understand this view of biblical prophecy. Evangelist Bray is now retired but his book "Matthew 24 Fulfilled" continues to be enjoyed by readers. The author, Babu G. Ranganathan, has his bachelor's degree with concentrations in theology and biology and has been recognized for his writings on religion and science in the 24th edition of Marquis "Who's Who In The East". The author's articles may be accessed at www.religionscience.com. English.Pravdu.Ru is a story partner of UFO DIgest.com.